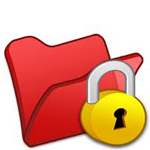 Lock your personal file by using simple batch program. This easy tutorial will walk you through how to hide and protect folders with password. So that nobody can access these files without knowing the password you specified. This trick is based on Batch Programming. You Only need Notepad which is already installed on your Windows computer by default. There are many numbers of software for protecting your personal file with password. Most of them is vulnerable amd we can easily hack those locked file using simple trick. Press Windows key+R to open RUN window. Now write notepad . Now copy and paste the following Batch program to notepad window. Press CTRL+F and find this PASSWORD_GOES_HERE and replace it with your own password. Now press CTRL+S to save the file. Select Desktop to save it in Desktop. 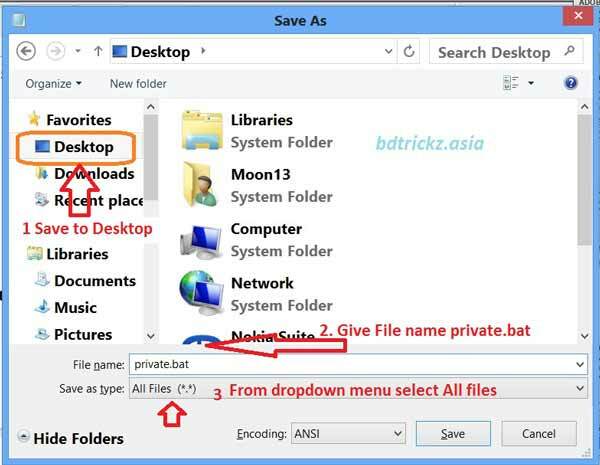 Give Filename as private.bat . Select Save as type to “All files” . Now close Notepad and navigate to your Desktop. You will see a file private.bat . Double click on it . A new folder will be created by this batch program named “Private“. Close the batch program. Now move your all personal files to this folder i.e. Private. Are you sure you want to lock this folder? press Y and press ENTER key. Now the folder is hidden and locked by password. If you want to Unlock this folder double click on private.bat and type your password and press ENTER key. End of the story: This is a simple trick to lock any folder by using a password. But this trick can be easily hacked too. Think how can you hack this folder and unlock file without knowing password and comment below. Aren’t you just simply hiding it? I mean, I switched on “View Hidden Files” and I found the folder just sitting there with a different name. Just right click on the batch file and open it with notepad. There we can find out the password.